George Graham Reviews Hem's "Rabbit Songs"
The idea of acoustic rock seems like an oxymoron -- or used to -- but whether you call it rock or something else, there has been a definite resurgence in interesting music by bands who play acoustic instruments, a number of which we have recently noted here, groups like Relative Sight, Marcus Eaton & the Lobby, and Rani Arbo and Daisy Mayhem to name just three, along with recent acoustic recordings by veterans like Elvis Costello. This week we have another example of a creative group who weave fascinating and very appealing music with acoustic instrumentation, going beyond the typical folk instruments like acoustic guitars, to full blown chamber groups with classical instrumentation. 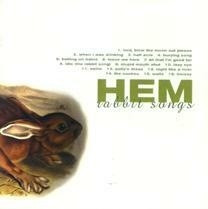 The band calls themselves Hem, and they named the CD Rabbit Songs. Hem is from Brooklyn, New York, and they have been together since 1999. They started when the duo of songwriter and keyboard man Dan Messé and multi-instrumentalist and record producer Gary Maurer decided to make an album together that they hoped would incorporate some traditional American folk music elements into a contemporary mix. After the addition of guitarist Steve Curtis, the trio began the search for a lead vocalist, placing an ad in the Village Voice, and apparently receiving a large number of demo tapes they felt were quite inappropriate or downright weird. Eventually, Messé took a call from one Sally Ellyson, who was interested in the position, but did not consider herself a regular singer. The demo tape she supplied, an a cappella performance of mainly old folk songs intrigued the Hem members, and she was invited to join, and thus the core of the group was formed. The group began recording their debut Rabbit Songs, by themselves originally as a kind of low-budget project. But once they got into it, they described the process as taking on a life of its own, with Messé selling off personal possessions to pay for the increasingly involved production and backing musicians, including classical string and woodwind players. The result, I suppose could be called American folk chamber music, rich with tastefully-arranged classical-styled groups, along with a kind of musical simplicity and directness that evokes new roots artists like Gillian Welch, or an acoustic variation on the languid introspection of the Cowboy Junkies. Ms. Ellyson, apparently not having had much formal vocal training, and being relatively new to singing with a group, brings a kind rustic folk quality to Hem's music, But she also shows an easy natural gift as a singer. The CD also contains some intriguing instrumentals that also embody the kind of chamber folk sound, revolving around Messé's piano work that can, at times, be vaguely reminiscent of early ragtime pieces by Scott Joplin. In addition to the basic Hem quartet, with piano, guitars, mandolin and vocals, there are some regular guests on the CD including drummer Mark Brotter, acoustic bassist Catherine Popper, and violinist Ronit Kirchman. But a majority of the tracks have additional players, most with a classical sound such as a string quartet and some woodwinds. Various arrangers are brought in as well for specific tracks. The result for the most part is a very attractive, and yet vaguely melancholy sound that is consistently intriguing in the way the strings are woodwinds are used in unexpected ways: not so much to "sweeten" as they say in the music business, but to add sonic colors that tend toward the musical equivalent of greys and browns. Another distinctive feature is how the tracks are often like miniature vignettes. There are 18 pieces on the 45-minute CD, some as short as 30 seconds, all of them under four minutes, that are often oblique and impressionistic lyrically. Hem originally made their CD Rabbit Songs in 2001 and released it independently, after having risked personal bankruptcy to obtain the funds for the production and guest musicians. The passion they showed for their music is evident in the CD's very distinctive sound with its juxtaposition of classical elements with almost rustic folk and old-time music. Now, their CD has been picked up distribution by a national record label, and already they have been garnering a great deal of critical praise in major newspapers and magazines, and indeed their piece When I Was Drinking, has been chosen for one of the NPR All Songs Considered CDs, with the instrumental part of the track used as fill music between stories on the news program. And though many may now just be hearing their music for the first time, they are already at work on a second CD, since it has actually been so long since their made this first one. Sonically, we'll give the CD close to an "A." While not at the upper audiophile level in terms of recording clarity -- the CD, presumably made in a modest studio, nevertheless has considerable warmth, and the dynamic range, the difference between loud and soft passages, is above the contemporary average. The group notes that they avoided any computer-based recording and sonic processing, and recorded the CD, the "old school way" as they note on their website. Their efforts at achieving an honest, organic sound were generally successful. Acoustic music continues to have unlimited possibilities, and Hem explores some of their own, with a distinctive sound that can evoke both Nick Drake and Gillian Welch, old-time country and classical chamber music. Though most artists like to avoid glib labels like these, I think calling Hem's music "chamber folk" is not off the mark. It's a very pleasing recording.